Mr Lillis suffers from a crippling bone disease which has caused his weight to drop to less than 80 pounds and has affected his eyesight and breathing. He has been in a prone position on a hospital bed for over 600 days and is incapable of moving as the bones of his spine have fused together. The campaign for his release has gained huge support this week when his partner, Roisin Lynch, began a public hunger strike in the heart of west Belfast with the support of Mr Lillis’s former comrades from the days of the H-Block blanket protest. Originally jailed on IRA arms charges in the seventies, Mr Lillis was arrested in October 2009 on an unrelated matter and remanded in custody. Although those charges were later dropped, his release was refused by the then British Direct Ruler, who ordered that his ‘licence’ be revoked. He has remained at the notorious Maghaberry jail in county Antrim ever since. “Brendan’s condition is very advanced. He has spent 20 months in hospital at Maghaberry where he has deteriorated and deteriorated. Roisin said she warned the jail of Brendan’s condition back when the former blanketman’s licence was revoked in October 2009. “I told them he needed to be mobile but they kept him on 23-hour lockdown [confined within his cell]. “Everything I said fell on deaf ears and now look at him, he can’t even lift a book to read because he is so weak. “Brendan is on morphine and is relying on other prisoners to check on him and pray with him. “He has nobody apart from the other prisoners, he just lies there in the bed where he had been for the past 600 days. He was recently diagnosed with anorexia and I am so scared he will die. All I want is to get him home. Roisin’s fast is taking place at a makeshift camp at the site of the former Andersonstown RUC station in west Belfast. It has been set up as a non-political independent ‘hunger camp’, welcoming all those interested in human rights, and has been supported by a wide variety of groups and political parties. Meanwhile, white-line pickets have continued nightly along the road in west Belfast. 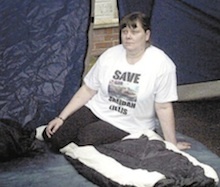 Support for the camp has spread throughout the local community, with chairs, tent, poster, sleeping bags and other essentials donated to maintain the protest. Officials from the Sentence Review Commissioners held a four-hour hearing into the 59-year-old’s case on Wednesday. They are expected to make their findings known to the west Belfast man’s legal team on Monday. Roisin has called on the Six-County Department of Justice to release her partner immediately on compassionate grounds. “[Minister] David Ford has the power to release him and allow him to return home to his family. However, to date has refused to do the merciful thing,” she said. Roisin was also joined by a number of high-profile republicans, including former IRA hunger striker Gerard Hodgins who has been strongly supportive to the campaign. In a statement released on behalf of Brendan Lillis by Mr Hodgins and with the support of other former blanketmen, it was claimed that Brendan Lillis “is dying and has been abandoned by an entire political system which is more interested in making statements about his condition than in applying their political power to remedy the situation. “We call for the immediate release of Brendan Lillis to his partner Roisin so that whatever time Brendan has left on this earth be spent with his immediate family. Families of those who died on hunger strike during the 1981 prison protest, along with human rights campaigner and former MP Bernadette McAliskey, have also lent their backing to the campaign. SDLP’s justice spokesman Alban Maginness and Alex Attwood visited the west Belfast protest camp and urged the British government to release the seriously ill prisoner. They said he is being held on the instruction of the British government’s Northern Ireland Office. Sinn Fein’s Jennifer McCann, who also attended the camp, urged Mr Ford to release Mr Lillis immediately. She said a party delegation who visited the prison this month was shocked by the deteriorating condition of Mr Lillis, and that she had just been told by Minister Ford that “he does not consider this a case for release on compassionate grounds which goes against what is in the public interest”. “Brendan Lillis’s licence was revoked on the grounds that he was a danger to the public yet the courts have deemed him too sick to stand trial. How can someone be a danger to the public when they are unfit to attend a court? eirigi general secretary Breandan Mac Cionnaith said the continued imprisonment or Mr Lillis was “callous in the extreme”. He said the “ridiculous” detention for a relatively minor IRA charge dating from the seventies “raises the wider issue of the British secretary of state’s ability to incarcerate republican ex-prisoners who have been released on license. “At present, Belfast woman Marion Price and Lurgan man Martin Corey are also being held in Maghaberry on the whim of Owen Paterson. There has still been no response to the situation from First Minister Peter Robinson or Deputy First Minister, Sinn Fein’s Martin McGuinness, or from the British government itself. A series of national and international events have been organised through a spontaneous internet action campaign. A three-day hunger protest was also launched this week in Derry, with the support for former republican prisoners there. The families of two Derry republicans who died as a result of medical conditions while in prison called for Mr Lillis’s release. The family of the late Pól Kinsella, died from leukaemia in Long Kesh in 1994, said: “Our family know at first hand the heartache of losing a loved one whilst being imprisoned. “It was whilst imprisoned in 1994 that Pól was to find out that he had leukaemia. The British establishment at that time refused to release him despite it being clear he was very seriously ill or the fact that the IRA had already declared a military cessation. Pól died at the young age of 31 on the 13th December of that year. The brothers and sister of the late James Moyne, who died in 1974 while waiting for medical treatment, also called for the release of the critically ill prisoner. “We the family of Vol. James Moyne call for the immediate release of Brendan Lillis from Maghaberry Gaol. “We believe that it is only right that Brendan Lillis, a seriously ill prisoner, be given the chance to receive the medical treatment he so badly needs and to spend his remaining days with his family. It has been 36 years since the death of our brother Jim, a victim of this same form of state violence. “It saddens and disturbs us greatly that conditions continue to exist whereby Irish people can be subject to arbitrary detention and suffer medical neglect while in gaol,” he said. Elsewhere, a fast was also underway in Cork and a vigil took place on the ‘Bridge of Peace’ in Drogheda. A small protest was also held by republican activists outside No. 10 Downing Street in London, while a candlelight vigil took place in Glasgow. Supporters of the campaign organised an online fast across the USA, while individual protests and online letter-writing campaigns were also underway this weekend in Holland, Belgium, Australia, France, and Italy.